4.3 Comic: "Writing is everywhere"
4.9 Comic: "I'm so lost!" 4.13 Comic: "But I love it!" 4.17 How ready are you? At university, you’ll be expected to write for different audiences and academic purposes. While writing did play an important role at school, at uni you’ll need to develop new skills and approach writing differently. Writing at university takes many forms and is discipline-specific; you’ll meet a range of writing genres and text types, each with its specific style, structure and language. You'll need to learn about the purposes and characteristics of these genres and draw on this knowledge as you write your assignments. Features of academic writing, such as objectivity and hedging, will also play a central role in your writing. To be a successful writer, you’ll need to craft your ideas in a way that conforms to the conventions of your subject area and communicates clearly with your audience. Like other forms of writing, academic writing is recursive, requires decision-making and takes time. To achieve good marks, you’ll need to have a clear writing process and ask key questions before, during and after you write. You’ll also need to invest time in revising, editing and proofreading your work. Make sure you understand the assignment question. Learn from expert writers in your subject area. And redraft and revise: writing is always re-writing. Now, how confident do you feel about your own writing skills? Complete the exercise on the following page before you move on to the final Module of this resource. 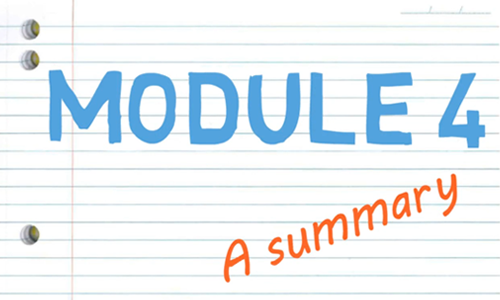 Note: Download the PDF file below so you can review Module 4 later.